This image from NASA's Wide-Field Infrared Survey Explorer, or WISE, features two stunning galaxies engaged in an intergalactic dance. The galaxies, Messier 81 and Messier 82, swept by each other a few hundred million years ago, and will likely continue to twirl around each other multiple times before eventually merging into a single galaxy. NASA's Wide-field Infrared Survey Explorer has captured a new view of two companion galaxies — a somewhat tranquil spiral beauty and its rambunctious partner blazing with smoky star formation. The unlikely pair, named Messier 81 and Messier 82, got to know each other a lot better during an encounter that occurred a few hundred million years ago. As they swept by each other, gravitational interactions triggered new bursts of star formation. In the case of Messier 82, also known as the Cigar galaxy, the encounter has likely triggered a tremendous wave of new star birth at its core. Intense radiation from newborn massive stars is blowing copious amounts of gas and smoky dust out of the galaxy, as seen in the WISE image in yellow hues. The new image is online at: http://www.nasa.gov/mission_pages/WISE/multimedia/gallery/pia13454.html . The Cigar galaxy is pictured above Messier 81. "What's unique about the WISE view of this duo is that we can see both galaxies in one shot, and we can really see their differences," said Ned Wright of UCLA, the principal investigator of WISE. "Because the Cigar galaxy is bursting with star formation, it's really bright in the infrared, and looks dramatically different from its less active companion." The WISE mission completed its main goal of mapping the sky in infrared light in October 2010, covering it one-and-one-half times before its frozen coolant ran out, as planned. During that time, it snapped pictures of hundreds of millions of objects, the first batch of which will be released to the astronomy community in April 2011. WISE is continuing its scan of the skies without coolant using two of its four infrared channels — the two shorter-wavelength channels not affected by the warmer temperatures. The mission's ongoing survey is now focused primarily on asteroids and comets. Because WISE has imaged the entire sky, it excels at producing large mosaics like this new picture of Messier 81 and Messier 82, which covers a patch of sky equivalent to three-by-three full moons, or 1.5 by 1.5 degrees. 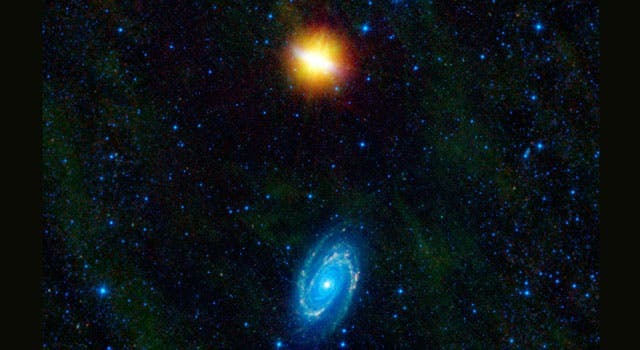 It is likely these partner galaxies will continue to dance around each other, and eventually merge into a single entity. They are both spiral galaxies, but Messier 82 is seen from an edge-on perspective, and thus appears in visible light as a thin, cigar-like bar. When viewed in infrared light, Messier 82 is the brightest galaxy in the sky. It is what scientists refer to as a starburst galaxy because it is churning out large amounts of new stars. "The WISE picture really shows how spectacular Messier 82 shines in the infrared even though it is relatively puny in both size and mass compared to its big brother, Messier 81," said Tom Jarrett, a member of the WISE team at the California Institute of Technology in Pasadena. In this WISE view, infrared light has been color coded so that we can see it with our eyes. The shortest wavelengths (3.4 and 3.6 microns) are shown in blue and blue-green, or cyan, and the longer wavelengths (12 and 22 microns) are green and red. Messier 82 appears in yellow hues because its cocoon of dust gives off longer wavelengths of light (the yellow is a result of combining green and red). This dust is made primarily of polycyclic aromatic hydrocarbons, which are found on Earth as soot. Messier 81, also known as Bode's galaxy, appears blue in the infrared image because it is not as dusty. The blue light is from stars in the galaxy. Knots of yellow seen dotting the spiral arms are dusty areas of recent star formation, most likely triggered by the galaxy's encounter with its rowdy partner. "It's striking how the same event stimulated a classic spiral galaxy in Messier 81, and a raging starburst in Messier 82," said WISE Project Scientist Peter Eisenhardt of NASA's Jet Propulsion Laboratory in Pasadena, Calif. "WISE is finding the most extreme starbursts across the whole sky, out to distances over a thousand times greater than Messier 82."